These cute leprechauns are always happy. Maybe that’s because they know they’re so cute hardly anyone will want to eat them. I have to admit, I put my leprechaun cookies on display in a pretty glass so I can enjoy looking at them before anyone can eat them. 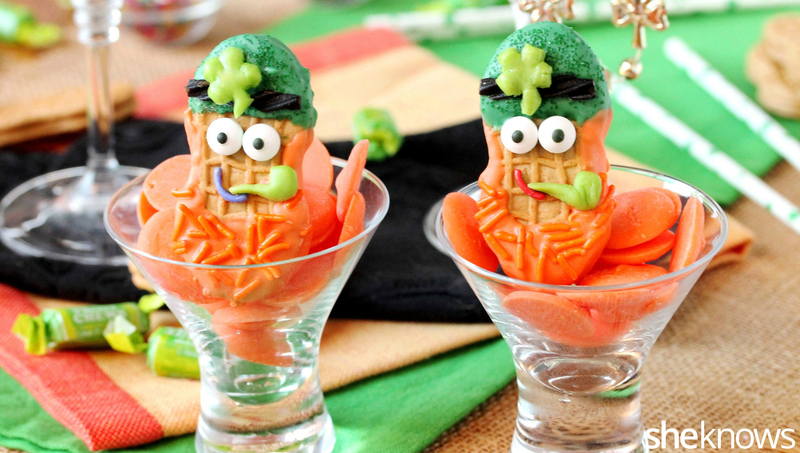 These leprechauns make perfect gifts for Saint Patrick’s Day. Just wrap them in cellophane, and tie them with a bow. They’re super simple to make too. You’ll need Nutter Butter cookies, orange and green candy melts, green sugar crystal candy sprinkles, orange plus various colored jimmies candy sprinkles, green Tootsie flavor rolls, candy eyeballs and Red Vines black licorice. Start by making the four-leaf clover decoration for the hat. Cut a slice off the flavor roll, and press it into a small circle. Then use the tip of a knife to make five small cuts around the outside edges of the circle, making sure to not cut into the middle. Shape the candy into a four-leaf clover with a small stem. Repeat for the remaining four-leaf clovers needed, and set aside. Next, make the pipe. Cut a small and thin lengthwise piece off the flavor roll. Form it into the shape of a small pipe. Repeat for the remaining pipes needed, and set aside. To make a band for the leprechaun’s hat, cut a piece of licorice that is as wide as the widest part of the Nutter Butter cookie, where the hat will be placed. Then cut that piece of licorice in half lengthwise. Next, cut each piece in half lengthwise again to make a narrow band. Repeat to make the remaining amount needed, and set aside. To a small bowl, add the green candy melts, and warm them in the microwave until they’re smooth and creamy. Dip one end of the cookie into the melted candy just enough to form the hat. Sprinkle green sugar crystal candy sprinkles on top of the melted candy, and lay the cookie on a parchment paper-lined flat surface, such as a cookie sheet. Lay a piece of the cut licorice onto the wet candy about 1/4 inch from the bottom of the hat to form a band. Using a toothpick, dab a small amount of melted candy on the back of a four-leaf clover, and lay the clover on top of the licorice band on the leprechaun’s hat. Use a toothpick to dab melted candy on the backs of the candy eyeballs, and lay each eyeball under the hat. For the smile, find a jimmie candy sprinkle that’s curved and shaped like a smile. Use a toothpick to add melted candy to the back of the jimmie, and add the smile to the cookie. Lay the smile up high and slightly off to one side to make room for the pipe. Using various colored jimmies for the smiles adds a touch of whimsy to the set. Set the cookies aside until the melted candy is completely set (about 30 minutes). Lay the cookie back onto the parchment paper. Sprinkle orange jimmies on top of the beard. Use a toothpick to add a dab of orange melted candy on the back of a pipe. Lay the pipe over the opposite side of the mouth from where the smile is. Set the cookies aside until the candy sets (about 45 minutes). These leprechauns love attention, so I’m sure they’ll be happy wherever they are. And they’ll keep smiling even if you take a bite out of them. They’re happy little guys. Adapted from Home. Made. Interest. For the hat’s four-leaf clover decoration: Cut a slice off the flavor roll, and press it into a small circle. Use the tip of a knife to make 5 small cuts around the outside edges of the circle, making sure to not cut into the middle. Shape the candy into a four-leaf clover with a small stem. Repeat for the remaining four-leaf clovers, and set aside. For the hat’s band decoration: Cut a piece of licorice that is as wide as the widest part of the Nutter Butter cookie, where the hat will be placed. Then cut that piece of licorice in half lengthwise. Cut each piece in half lengthwise again to make a narrow band. Repeat for the remaining bands, and set aside. For the hat: To a small bowl, add the green candy melts, and warm them in the microwave until they’re smooth and creamy. Dip 1 end of the cookie into the melted candy just enough to form the hat. For the hat: Sprinkle green sugar crystal candy sprinkles on top of the melted candy, and lay the cookie on a parchment paper-lined flat surface such as a cookie sheet. Lay a piece of the cut licorice on the wet candy about 1/4 inch from the bottom of the hat to form a band. For the hat: Using a toothpick, dab a small amount of melted candy on the back of a four-leaf clover, and lay the clover on top of the licorice band that’s on the leprechaun’s hat. For the pipe: Cut a small and thin lengthwise piece off the flavor roll. Form it into the shape of a small pipe. Repeat for the remaining pipes, and set aside. For the smile: Find a jimmie candy sprinkle that’s curved and shaped like a smile. Use a toothpick to add melted candy to the back of the jimmie, and add the smile to the cookie. Lay the smile up high and slightly off to 1 side to make room for the pipe. Set the cookies aside until the melted candy is completely set (about 30 minutes). For the beard: To a small bowl, add the orange candy melts, and warm them in the microwave until they’re smooth and creamy. Try not to handle the cookies too much when making the beard, or the green candy may smudge from the heat of your fingers. Dip the uncoated end of the cookie into the melted orange candy to make the beard. Use the side of a toothpick to spread the melted candy up the sides of the cookie (to the edge of the hat) to make the “sideburns.” Lay the cookies back onto the parchment paper. For the beard: Sprinkle orange jimmies on top of the beard. Use a toothpick to add a dab of orange melted candy on the back of a pipe. Lay the pipe over the opposite side of the mouth from where the smile is. Set the cookies aside until the candy sets (about 45 minutes).